Last week I got an inquiry from Casey R. Ruff at the Simon Fraser University in Burnaby, British Columbia, Canada in response to my blog post, “Don’t Stop Running Yet!” from earlier this month. Ruff wanted to share his report from earlier this year, entitled “Consequnces of decades of intense endurance training: Is there a cardiovascular overtraining phenomenon?” This is an excellent review of the data on this topic. If you’re scientifically-minded, I would encourage you to give it a read. If you’re interested in pursuing further reading, the reference list is extensive and useful. The report makes the case for the hypothesis that intense endurance training over many years may produce unwanted heart disease. 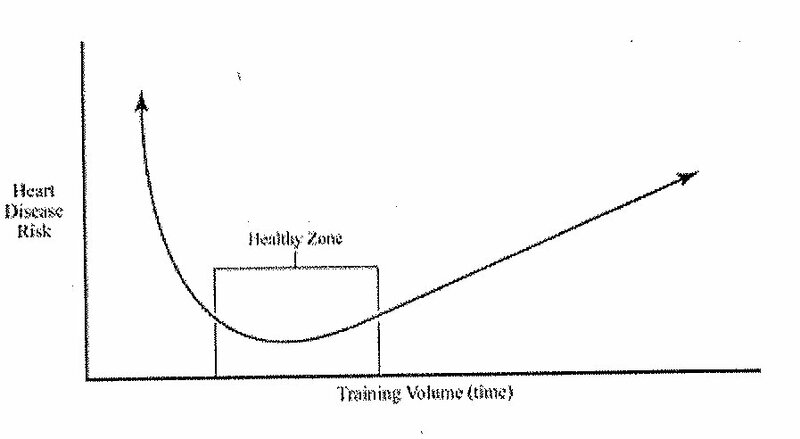 The situation is summed up well in this figure which suggests a sweet spot, or “healthy zone,” for training volume. Less or more exercise leads to greater heart disease risk over the long term. I’ve noted before that many biological systems are known to have a “sweet spot” phenomenon. This may be no different. 1. Is there any evidence for increased mortality rate or shorter life-expectancy because of participation in some sort of endurance sport? 2. What explanation would you provide for the observation that most incidents of sports-related sudden cardiac death (SCD) occur in NON-veteran athletes? And with autopsies that often show relatively unremarkable cardiac findings? 3. Do you believe that veteran endurance athletes are at increased risk of SCD compared to non-veteran athletes? And what is the magnitude of that risk? 4. What are the consequences to the athlete who develops atrial arrhythmias? How bad is that problem? Ruff and his colleagues correctly suggest that further investigation with longitudinal studies are sorely needed. I’m hopeful that with increased participation in endurance sports and increasing public dialog about this issue that these studies will be undertaken. 1. Don’t Stop Running Yet! Great questions. Has Ruff responded yet? Thanks, Armi. Casey seems very excited about these issues. You would enjoy corresponding with him. I got an email last from Casey last week. He said he was working on a reply. In the interest of good follow-up, I’ll post his answers.